Winter is coming to Iowa about ten days early. National Weather Service meteorologist Jim Lee says the first statewide snowstorm system of the season is about to swoop over the state. 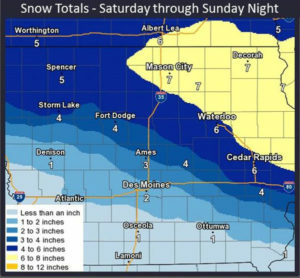 Lee says, “Our confidence is pretty high for snow across about the northern half of the state on Saturday and maybe a more widespread but lighter snow on Sunday.” The latest computer model shows southwest Iowa getting just an inch or two of snow while the opposite corner may get a lot more. “It depends on how you define ‘a lot,’ but there’s definitely the possibility for more than six inches of snow total between the two days across northeastern Iowa,” Lee says. “Anybody up there is going to have to break out their shovels and snowblowers, that’s for sure.” An area from Mason City and Waterloo to Decorah and Dubuque could get seven inches of snow, or more. 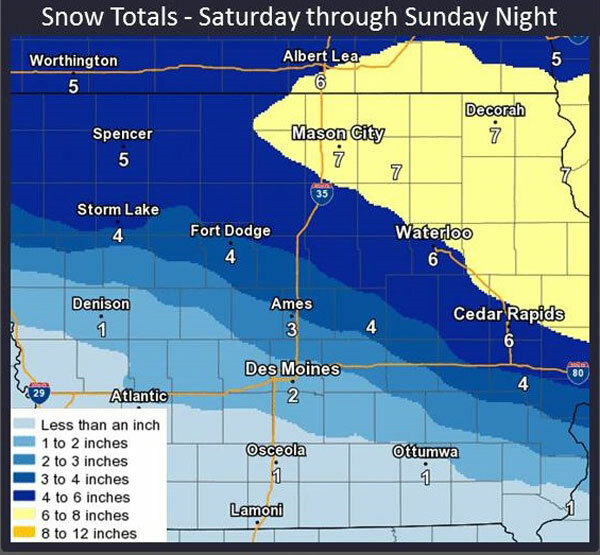 “The most significantly accumulating snowfall will begin in northwestern Iowa on Saturday morning and spread to the northeast by the afternoon, falling through the night and tapering off and also spreading out on Sunday,” Lee says. “Some areas, particularly north and northeastern Iowa, may see nearly continuous snowfall for about a day and a half, and that’s where the highest totals are expected.” The calendar says winter officially arrives on December 21st. Iowa’s been whalloped by big snowfalls before Halloween in some years, but Lee says this storm’s right on track. “This is really pretty normal,” Lee says. “It seems like most years in Iowa, we see the first significant snowfall generally in the first half or so of December. There’s a lot of variability. Some years it’s in November, some years it’s not until Christmas, but this is pretty close to normal.” The storm will leave behind bitter cold temperatures as part of what’s known as a Polar Vortex. Wind chills early next week may be 10 and 20-degrees below zero.